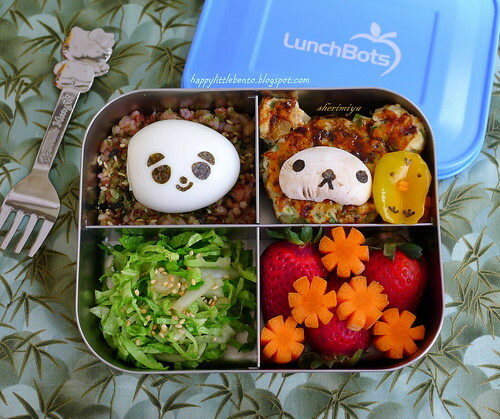 Rilakkuma Chicken Miniburgers LunchBots Bento, a photo by sherimiya ♥ on Flickr. Today I made mini chicken burgers for TinySprite. MisterMan is in the mountains somewhere, eating cowboy stew and soudough bread or something like that. With only one bento to make, I decided to take some extra time and make a cute one. I fashioned a bear face with ears, and added nori details to a piece of mushroom to make Rilakkuma; his sidekick Kiiroitori is cut from a yellow sweet pepper. There's also a panda egg on a bed of furikake rice, some Japanese slaw (shredded napa cabbage tossed with rice vinegar, sugar, shoyu and sesame seeds) -- the kids both LOVE this salad! -- and more supersweet organic strawberries and carrots. All packed in the sky blue LunchBots Quad. Happy Wednesday! Looks so cute and yummy, thanks for the inspiration! I'm going to try it next week. Do you have a recipe for the mini chicken burgers? Or are all your recipes just made up...? I just kind of winged the burgers: to about one pound of ground chicken, I added a stalk of chopped celery, half a chopped yellow onion, about 2T flour, an egg, salt, pepper, shoyu. After frying on one side, flip and brown the other, and cover to steam and finish cooking. You can serve with teriyaki sauce, as I did, or ketchup.